I used DBAN on a hard drive in another system then took it and put it in my computer and windows 10 doesn't recognize the HDD. It can be seen in the BIOS but not in windows. DBAN ran for 12 hours, and the HDD is a WD Caviar Black. I can still use windows from my other HDD, but I cannot do anything with the new HDD. Thanks in advance! Sorry, I didn't think this through. I am not going to be at my computer for about another week. Should I post again then, or what? Sure. Come back, when you have access to your pc again. I am back and I now can give you a picture of my disk management. That fixed it. Thank you so much for the help everyone! See my sig for how to mark a Best Answer and Solve your thread. TY! 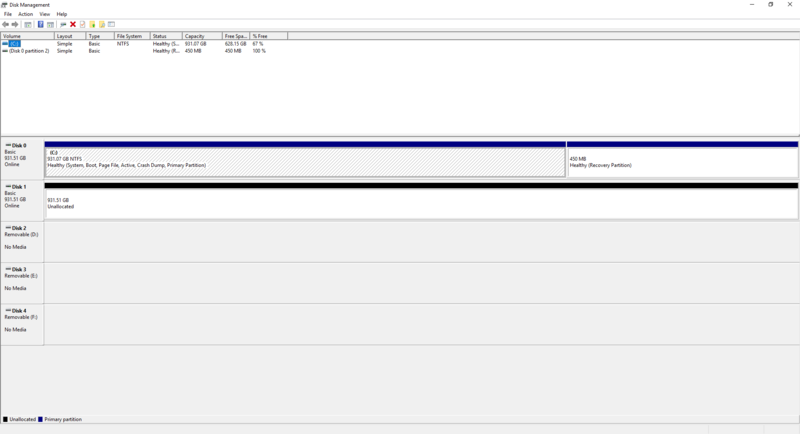 Question How do I take the drive of my old system and use it as a secondary drive in my new config ? Solved! M.2 Drive not found by system after raid switch. Will old drives with Data cause issues in new system? Solved! Can I transfer files to a new system drive by putting it into another computer?